Johannes Franciscus Spohler (1853-1923) was a Dutch Romantic painter. He was the son of Jan Jacob Spohler (1811-1866) and the younger brother of Jacob Jan Coenraad Spohler (1837-1894), who both painted mainly landscapes and icescapes. 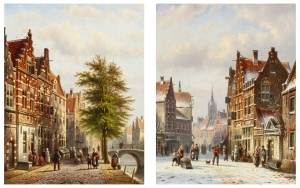 Johannes focused more on painting streetscenes just like Cornelis Springer (1817-1891).